Sassnitz passenger and car ferry ticket prices, timetables, ticket reservations and information for ferries sailing from Sassnitz to Klaipeda, Ronne and Trelleborg. Compare all available Sassnitz ferry ticket prices in real time and book the cheapest available Sassnitz car and passenger ferry tickets sailing to and from Sassnitz, Klaipeda, Ronne and Trelleborg with Bornholmstrafikken, Scandlines Ferry or DFDS LISCO ferries online with instant confirmation. Book Sassnitz Ferry Tickets with Bornholmstrafikken, Scandlines Ferry or DFDS LISCO for ferries sailing from Sassnitz to Klaipeda, Ronne and Trelleborg online in advance to enjoy the cheapest available ferry ticket price. The price you see is the price you pay. There are no hidden extras or surprises such as added fuel surcharges or booking fees and we do not charge you anything extra for paying with a Visa Electron card. The price we quote you for your selected Sassnitz passenger or car ferry ticket, onboard accommodation and vehicle type is all you will pay, and that's a promise. To obtain a Sassnitz ferry ticket price and book your ferry ticket securely online please use the real time ferry booking form on the left. You are also able to add a hotel at your destination, or anywhere else, to your ferry ticket when completing your ferry ticket reservation. Sassnitz lies on the Jasmund Peninsula, to the south of the Stubbenkammer cliffs, surrounded on the north by the beautiful Stubnitz beech forests. Sheltered by chalk quarry and forest, Sassnitz is situated terrace-like in a valley that was washed out of the cliff by the little river Steinbach. Because of its southeastern location there is still a southerly tuned holiday atmosphere in front of the bars and pubs in the harbour, when the evening is already drawing on at other places on Rügen. A stroll along the promenade with the longest mole in Europe joins together the spa-guest of today with that of the fashion spa from 1870. The farmers’ village Crampas and the fishermen’s village Sassnitz were at the beginning of the Sassnitz of today. Their different mentalities make up the charm and liveliness of the only harbour city on the island of Rügen. 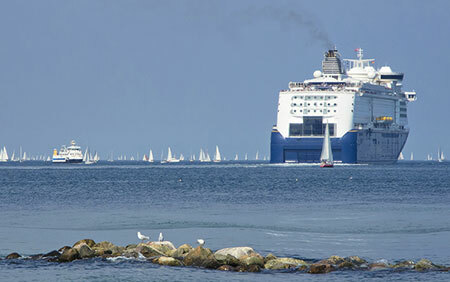 From Sassnitz there are international ferry services to Trelleborg in Sweden and Klaipeda in Lithuania. There are many attractive places to see in and around Sassnitz. The town itself has a pretty fishing harbour. Cape Arkona, Rügen's most northerly point, is on the Wittow peninsula in the north of the island - its two lighthouses can be seen for miles around. The seaside resort of Binz is known for its white villas and spa architecture. International Country Telephone Code - + 49Port Location - The Sassnitz harbor is no longer in use as a port, the modern port is located near Dubnitz known as "Fahrhafen Sassnitz". Trains from Bergen auf Rügen, Binz and Stralsund. A change may be necessary at Bergen or Leitzow if arriving on a long distance train. The train station and bus station are next to each other, and only a short walk to the town. There is a bus link to/from the Ferry Port (for Sweden). If using the regular Sassnitz - Binz bus service for the ferry, the nearest stop is in Dubnitz (after the turning to the port at the top of the hill, if traveling from the Binz direction. Best Price Guarantee - We always offer you our lowest available Bornholmstrafikken, Scandlines Ferry or DFDS LISCO passenger and car ferries ticket price to and from Sassnitz. There are no hidden extras or surprises such as added fuel surcharges or booking fees and we also we do not charge you anything extra for paying with a Visa Electron card. The price we quote for your selected Sassnitz ferry ticket, onboard accommodation and vehicle type is all you will pay, and that's a promise! In the unlikely event you find the same all inclusive Sassnitz ferry ticket cheaper in the brochure of any other tour operator we promise that we will do our best to beat that price or offer you the choice of requesting a refund. To book Sassnitz car and passenger ferry tickets please click here. At ferryto.co.uk you are able to obtain live Sassnitz ferry ticket prices, check availability and book car and passenger ferry tickets to and from Sassnitz at our lowest available ticket price. Ferryto.co.uk is part of the world's largest online ferry ticket distribution network providing the ability to book over 80 major European ferry operators including to Sassnitz and to over 1,200 other ferry routes throughout the UK, France, Spain, Ireland, Holland, Eastern Europe, the Mediterranean, the Baltic and North Africa.